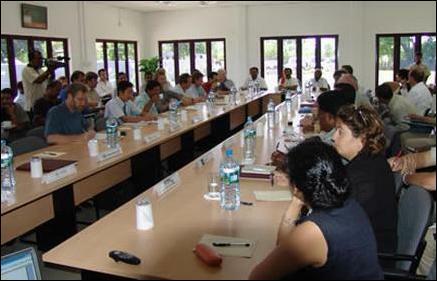 Head of Liberation Tigers Political Wing, S.P.Thamilchelvan met with United Nations and International Non-Governmental Organization (INGO) delegates at the Planning and Development Secretariat of the LTTE in Kilinochchi Tuesday, LTTE's Peace Secretariat website said. Thamilchelvan told the delegates the critical importance of making the "people real stake holders in development." "Mr. Tamilselvan outlined the current political situation and highlighted the importance of co-ordinating and synchronizing the activities of humanitarian agencies in view of the urgent necessity to upgrade the shattered life of the war affected Tamil people. The PDS Mr. Thamilchelvan said will function as the pivotal unit that will identify needs of the people and formulate plans to carryout quick implementation with the assistance of experts from the Tamil Diaspora," reported the website. "The lack of progress in the peace process, a stalemate political situation in Colombo and the continued suffering of the Tamil people in the NorthEast who have been denied the dividends of peace were pointed out by Mr. Thamilchelvan as important factors in cutting the barriers to reach the people and serve them at the time of need. The delay in institutionalising the ISGA is causing grave concern in the minds of the Tamil people and should therefore be not a cause for postponement of humanitarian delivery," the website further said. Country and field representatives from UNICEF, UNHCR, ILO, WHO, ICRC, FORUT, OXFAM, CARE, World vision and other officials participated in the meeting. Associated Mr. Thamilchelvan were Mr. Thuyavan, Director of the PDS Eelamaran, Mr. Thangan, Deputy Head of the Political Wing and Mr. Selvin Ireneus, Director of SIHRN.